Hot stone therapy goes beyond the physical experience of typical massage and enters deeper dimensions of relaxation, health and well-being. Physically the circulation and metabolism are stimulated; mentally you reach a state of deep relaxation and spiritually you are balanced whilst healing takes place. 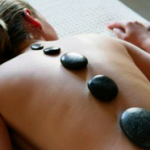 Hot stone therapy combines traditional massage with the use of smooth, heated basalt stones. Benefits include: deeper relaxation than standard massage techniques, toxin removal, improved mobility, calming of the nervous system, improved circulation, relaxation, decongestion, detoxification and accelerated lymph drainage. What could be nicer than the feel of smooth hot stones massaging away the cold, stress, tension, tiredness, aches and pains. Hot Stone Massage is a truly relaxing treatment using hot stones of varying sizes on parts of the body – from the forehead to between the toes – giving a deep massage and creating a sensation of warmth and comfort.